Who Were The Stickyback Photographers in Ireland? In the information below we have tried to identify stickyback photographers across the UK, mainly from information gleaned from local newspapers. But many of these photographers would not have used newspapers to advertise, preferring instead to advertise extensively at their premises. Others will not have advertised and may only become known through surviving examples of their work. Survivals of sticky back photos are not that common due mainly to their small size and confusion with later photo booth images. This is a work in progress and much more awaits discovery - we welcome any additional information on "Sticky Backs" which you may come across. We have included the whole of Ireland on this page as we are referring to a period before Partition. Considering the relative populations it appears that stickyback photographers were more numerous in Ireland than the rest of the UK. Stickyback photographers have so far been found in: Arklow, Ballymena, Bangor, Belfast, Coleraine, Cookstown, Dublin, Dungannon, Kells, Larne, Longford, Lurgan, Magherafelt, Mohill, Monaghan, New Ross, Newry, Tralee, Tramore and Wicklow. Possible identity of practitioner: COWAN, Harry. References: Dublin Daily Express - Thursday 29 July 1909 p1. "Youth wanted for Sticky Backs; used to taken today and ready tomorrow; none but experienced need apply. H.Cowan, Bridge street, Arklow". According to Thaddeus C. Breen's listing of Photographers and Studios in Dublin on his impressive Irish Archaeology site (http://www.irisharchaeology.info/genealogy/photographers.html) Harry Cowan was the owner of a number of studios in Dublin: the Franco-British Portrait Company, Grafton Studios, Camden-street Studio, Sackville Portrait Studio, and the Earl Portrait Studio. His brother, Jack, operated the ‘While-U-Wait’ booth on the promenade in Bray during the summer months. References: Passing reference to the premises in the report of a traffic accident: Ballymena Weekly Telegraph - Saturday 15 August 1908 p8. "Two Ballymena cyclists, Mrs Heaney, Albert Place and Mr James Giffen, William Street, came into collision on Saturday night at Broadway. Both were thrown from their machines and Mrs Heaney, who came in sharp contact with the ground sustained a severe cut at the back of the head. The other cyclist, who was uninjured, assisted in conveying Mrs Heaney to Messrs Sticky Backs premises adjacent" Then a return visit recorded in the Ballymena Observer - Friday 29 January 1909 p7. " First appearance of Christopher the Sticky Back King. your photo 6d per dozen. Opening at Broadway Ballymena tomorrow, Saturday 30th inst. NB Christopher's Sticky Backs never fade." Ballymena Weekly Telegraph - Saturday 24 December 1910 p8. "The numerous people who were delighted with their photos taken at Sticky Backs. Broadway. Ballymena, about two years ago. will be interested to learn that these famous Photo Kings have paid the town a return visit, they having now commenced business again at Ballymoney Street (corner of Broadway). The particulars given in the advertising columns of this paper to-day show, inter alia, that superior high-class Midgets can be supplied at the infinitesimal charge of sixpence per dozen, and that photos can be "taken day or night: wet or fine". The universal satisfaction which Sticky Backs gave before in Ballymena and district should guarantee them another big clientele now". Their advertisement on page 2 refers to them as "The Original American Miniature Photographers, Sticky Backs the Photo Kings - local branch at Ballymoney Street Ballymena". This wording suggests that in 1910 this was a branch from another studio. References: North Down Herald and County Down Independent - Friday 05 July 1912 p1. "Dont forget to visit the Clifton Studio 62 Seacliffe Rd, Stickybacks 6d per dozen, panel midgets 6d per half,postcards 1s per 1/2 doz cabinets 3 for 2s6d. Branch from Gledhill's 94 Bridge End, Belfast." North Down Herald and County Down Independent Friday 29 August 1913 p6: " When in Doubt ABOUT PHOTOGRAPHS CALL AT THE CLIFTON STUDIO, 62 Seacliffe Road, Bangor. There is nothing in the nature of an experiment in coming to us. We employ none but Efficient Assistants, who perform their duties under the direct supervision of Mr R. GLEDHILL, and are aided by the most up-to date Apparatus obtainable. Our Prices are:— STICKYBACKS, 6d per dozen. Highly-Glazed POSTCARDS, 6 for 1s. PANEL MIDGETS, 6 for 6d. CABINETS, 3 for 2s 6d. WE HAVE OTHER SIZES, EQUALLY REASONABLE. Our Prices are certainly low, but the quality of our work is the Highest that has ever been offered to the Public. The fact that we can successfully run a Business of this kind without resorting to SUNDAY TRADING or TOUTING is convincing prof that it is our actual work which is appreciated. So why hesitate? Come right away. Also AT 94, BRIDGE END, BELFAST. According to the 1911 Census of Ireland there was a photographer called Rowland Gledhill b:1886 England, living at 43 Hogarth Street, Duncairn, Antrim, Ireland, with his wife Elsie, b: 1888 England and son Malcolm Rowland Gledhill b 1911 Belfast. By 1939 Rowland Gledhill was living at 36 Victoria House, Lambeth, London and he was a photographer with the War Office. Possible identity of practitioner: HAIG, Charles, aka "Sticky Backs" and "The Original American Sticky Backs". References: This firm used a particularly humourous form of advertising incorporating fake news. They also claimed to be the original American Sticky Backs using a unique "Electroscope". Belfast News-Letter - Thursday 28 December 1905 p2. "For sale. Sticky Backs are making a speciality of copying from old or faded photographs 9d per doz; enlargements at remarkably low prices; 1/2 doz American panel cabinets 1s. Sticky Back photos only 6d per doz. Sticky Backs 146 Upper North Street." Belfast Telegraph - Thursday 28 December 1905 p3. "Sensation in North Street. Police charge the crowds - an unusual occurrence - owing to an advertisement by that world-famed photograph firm, The Original Sticky Backs giving 1 dozen of highly enamelled photographs for the humble sum of sixpence, and are still giving them. Sticky Backs 146 Upper North Street". Belfast Telegraph - Friday 29 December 1905 p2. "Photography - wanted a smart respectable lad as apprentice. Apply Sticky Backs 146 Upper Street". Belfast Telegraph - Friday 19 January 1906 p3. "Election Result. Sticky Back wins easily. For further particulars see window 146 Upper North Street". Belfast Telegraph - Monday 05 February 1906 p1. "500 dollars reward if we don't take your photographs at sixpence per dozen. Sticky Backs North Street." Fermanagh Herald - Saturday 17 March 1906 p5. "STICKY BACKS are doing Oil Portraits, beentifully framed and finished, at 20s; worth £5, see specimens 146 North Street, Belfast. STICKYBACKS are doing Black and White Enlargements at unheard-of prices; see specimens 146 North Street, Belfast. HAVE you an old or faded photograph of someone dearly loved? We will Copy same for ninepence per dozen.—Sticky Backs.- 146 North Street, Belfast. STICKY BACKS take Photographs, day or eight, from Sixpence per dozen.-146 Upper North Street, Belfast.. STICKY BACKS says to come through the day and avoid the crush of the evening.-146 North Street, Belfast. ARMY and Navy Uniforms and Fancy Costumes for Customers use, free of charge, at Sticky Backs.-146 North Street, Belfast. STICKY BACK Specialities.—One dozen of your Photographs, highly enamelled and finished, for sixpence.-146 North Street. Belfast. Photograph in a flash : only sixpence per dozen.—Sticky Backs, 146 Upper North Street, Belfast. £5 Worth for Twenty Shillings.—Portraits beautifully Painted in Oils and nicely framed. Specimens at :Sticky Backs.-146 North Street, Belfast 10 Sticky Backs taken in a flash for sixpence at 146 Upper North Street, near Royal Avenue, Belfast CAUTION !—Sticky Back's only address in Belfast is-146 UPPER NORTH STREET. We have no travelling agents. We are the original and only Sticky Backs — mum's the word." Belfast Telegraph - Saturday 31 March 1906 p2. "Sticky Backs only address in Belfast is 146 Upper North Street (a few doors from Royal Avenue). S.B. is the original and only patentee of the now famous miniature photo process. "Imitation is the sincerest form of flattery." Follow who can. There is only one Sticky Backs. Photographs highly Enamelled and finished from 6d per dozen, taken today, ready tomorrow. We copy or enlarge from any photograph. Oil portraits a speciality. See specimens at studio. Lists post free." Belfast Telegraph - Saturday 07 April 1906 p6. "Startling occurrence in North Street. A bull in the photographers. Great excitement was caused in the Sticky Backs Lighting Photographer's 146 North street, by the sudden appearance of a ferocious looking bull, which rushed into the shop. It appears the animal was frightened by the noise of the traffic and escaped from his drivers; but doubtless it is another wonderful example of animal intelligence, the bull being attracted by the outstanding offer made by this marvellous firm." Belfast Telegraph - Monday 23 July 1906 p2. "Caution. "Imitation is the sincerest form of flattery" Our name is being copied, our method of advertising is also being copied; but one consolation, our work cannot be copied. Every photograph taken by the Electroscope, the only one in Ireland. We are the original American Sticky Backs, 146 North Street. Beware of imitations. "Belfast Telegraph Wednesday 25 July 1906 p1. "12 photographs taken by Electroscope for sixpence. The original Sticky Backs 146 North Street, Belfast and Bangor". Belfast Telegraph - Thursday 30 March 1911 p1. "Charles Haig's 146 Upper North Street the originator of the now famous Sticky Back photograph". References: Belfast Telegraph - Thursday 22 November 1906 p2. "Christmas Post Cards with mottoes and your photo on each; great novelty; 6 for 1/6d. Also Sticky Backs 12 for 1/- daylight or by electric light, till 9 o'clock pm. Reid Brothers 31 High Street, Belfast". References:Belfast Telegraph - Friday 25 June 1909 p1. "Send me 1s3d and stickyback will make same to six beautiful postcards. Alexander, 10 Dunluce Avenue". References: Irish News and Belfast Morning News - Friday 22 December 1911 p1: "Genuine enamel post cards at the Royal Studio; everything in photography from a humble stickyback to high class cabinets or enamel miniatures. Semi tints, sepia, carbons &c, at prices within the reach of all." References: North Down Herald and County Down Independent - Friday 05 July 1912 p1 had an advertisement for a studio in Bangor, which was a branch from Gledhill's 94 Bridge End Belfast. "Dont forget to visit the Clifton Studio 62 Seacliffe Rd, Stickybacks 6d per dozen, panel midgets 6d per half, postcards 1s per 1/2 doz, cabinets 3 for 2s 6d. Branch from Gledhill's 94 Bridge End, Belfast." North Down Herald and County Down Independent Friday 29 August 1913 p6: " When in Doubt ABOUT PHOTOGRAPHS CALL AT THE CLIFTON STUDIO, 62 Seacliffe Road, Bangor. There is nothing in the nature of an experiment in coming to us. We employ none but Efficient Assistants, who perform their duties under the direct supervision of Mr R. GLEDHILL, and are aided by the most up-to date Apparatus obtainable. Our Prices are:— STICKYBACKS, 6d per dozen. Highly-Glazed POSTCARDS, 6 for 1s. PANEL MIDGETS, 6 for 6d. CABINETS, 3 for 2s 6d. WE HAVE OTHER SIZES, EQUALLY REASONABLE. Our Prices are certainly low, but the quality of our work is the Highest that has ever been offered to the Public. The fact that we can successfully run a Business of this kind without resorting to SUNDAY TRADING or TOUTING is convincing prof that it is our actual work which is appreciated. So why hesitate? Come right away. Also AT 94, BRIDGE END, BELFAST. References: Belfast Telegraph - Thursday 20 November 1941 p2: " DEATH OF IRISH SHOWMAN. BOUGHT AN EXHIBITION. The death has taken place at Bray of Mr. John Mc Gurk, who from being a dealer in Smithfield Market, Belfast, came to be a leading figure in the Irish show business. He was a pioneer of the "stickyback" photograph, and at one time ran several studios in the city. One of his most spectacular ventures as a showman was to buy the White City Exhibition at Wembley and transfer it to Rosslare." References: From the surviving adverts this may well have been a short visit by a travelling photographer, who unusually was offering photos taken in a motor car. Northern Constitution - Saturday 02 February 1907 p1. "1000 nice girls wanted at once to have their photo taken: only sixpence per dozen: we are here for a few weeks only. Sticky Backs Coleraine" Coleraine Chronicle - Saturday 13 April 1907 p1. "I say Tom, come and be taken in a motor car at Sticky Backs 6 post cards 1s. Diamond, Coleraine"
References: This could have been a return visit by the same photographer as in 1906/07 above. Mid-Ulster Mail - Saturday 28 August 1909 p3. "Hello. Sticky Backs are in town again. Our specialist is 6 high class postcards 1/- each card highly enamelled. Note our address Sticky Backs 29 William Street, Cookstown." References: Unusually this Sticky Back photographer took photos at customers' homes as well as in the studio. Freeman's Journal - Tuesday 06 October 1903 P8 (same advert appeared until 21 Oct 1903) "Photography - send Cabinet or CDV photo and postal order value 1s1d for 12 large sized Sticky-Back Photos. Address, Manager, Berlin Studio, 62 Dame Street, Dublin" Freeman's Journal - 22 October 1903 P8. "Photography: why go to studios I do photos at your own home, day or night. Call and see Stickyback Manager, 62 Dame St Dublin". Freeman's Journal - Friday 20 November 1903 P8. "STICKY-BACK Photos, 12 for 1s, beautifully finished, larger and better than ordinary stamp photos: send on your photo to be copied, ls 2d post free Chic Photo Co., 62 Dame Street, Dublin"
References: Freemans Journal Tuesday 26 January 1904 p8. "Stickybacks: The Irish Stick-on Photo Co 46 Henry Street, are still busy taking the above at 4d per dozen, great value Y 4 pay more?" Freeman's Journal - Monday 01 February 1904 p8. "Stickybacks: Medallion Ovals; The Irish Stick-on Photo Co, 46 Henry Street are still taking the above at 4d per dozen; Y 4 U go and pay more." One possibility for the identity of this photographer can be found on Thaddeus C. Breen's listing of Photographers and Studios in Dublin on his impressive Irish Archaeology site (http://www.irisharchaeology.info/genealogy/photographers.html) Michael Patrick Finnerty ran the Shamrock Studio at 46 Henry Street and his wife also worked there as a miniature painter. No dates are given for this, but by 1909 Finnerty and Co were at 9 Westmoreland Street Dublin. References:Wicklow People - Saturday 16 July 1904 p14. "PHOTOGRAPHY The foreign invasion is now threatening the photographic trade, but you look for the water-mark on your note paper and wear Irish Tweed. Then leave the foreign Photographs to the Shoneens and get your photograph taken at the Celtic Studio 69 Camden Street Dublin. Cabinets Enamelled 3 for 3s.6d. Every thing Photographic, from Stickyback to a life size enlargement. Patronised by leading Nationalists and Trade Unionists. Open on Sundays and Bank Holidays. John Arnall, 69 Lower Camden street, Dublin" Dublin Evening Mail - Thursday 22 November 1906 p3. STICKY-BACK PHOTOGRAPHERS AT WAR Rival Dublin Studios. Remarkable scene in court. A dispute between Dublin sticky-back photographers was investigated at the Southern Police Court, before Mr Swifte, today, when Henry Roe McMahon, Aungier street, was summoned by John Arnall. 11 Camden street, for the alleged unlawful detention of fifty photographs and one dozed mounts. Mr James W.Davis, solicitor, prosecuted and Mr McCune, solicitor, defended. Mr Davis, in opening the case said it was a row between two stickyback photographers. Complainant went into the witness box. He stated that he had been a photographer in Dublin for six or seven years. Mr Mccune. Has the witness been sworn? Witness - I have been sworn, do you want me to swear again? I will if you like. Do you believe that book? asked Mr McCune, dramatically pointing to the testament. Witness (warmly) - how dare you ask that question. My father was a Wesleyan. Mr McCune - Are you in the habit of boasting of being an atheist? Mr Davis here protested. Mr McCune - He does not believe in a supreme being. Mr Davis - you are full of holiness this morning. Mr McCune said he was not in the habit of putting questions without a reason. Witness - I have never in the whole course of my existence appeared on and Atheistic platform. Continuing his evidence witness said he carried on an extensive business. the defendant was once in his employment and had charge of a small studio. Defendant remained with him as an assistant until September of this year. After leaving him the defendant opened a shop of his own in Aungier street. Outside defendant's shop there were three photo frames and witness discovered that these frames contained a number of photographs which had been taken in complainant's studio in Camden street. Defendant, when he was in witnesses employ, insisted on taking a couple of negatives of each photo. at first complainant thought that was due to defendant's want of confidence. the cost of material for sixpenny photos was one penny. The value to the public was sixpence. Mr McClune - Did your business prosper during the last few years since defendant was employed by you? I put him in charge of a shop which brought in an income of £15 per week. Its business went down to £7 a week. Mr Swifte - Did you make any application to Mr McMahon for the property? Yes I made two applications and did my best to get the pictures back. He further stated that all the photos were taken within a period of three months in one particular studio. For the defence it was stated that photos displayed by the defendant were given to him as presents by friends. Defendant went into the box and gave evidence in support of this. he said that he opened a studio about three weeks after he left Mr Arnall. He said he had never taken any of Mr Arnall's property. All the photographs exhibited by him were his own property and those which had been taken at Mr Arnall's were given to him by friends. Several witnesses were called in support of this statement. Ultimately the summons was withdrawn on the defendant undertaking that he would not exhibit in future on his premises photographs taken at Mr Arnall's studio. References: Irish Times - Thursday 01 February 1906 p10, Case in the Land Judge's Court involving insolvency of Mr J.A.Taylor, owner of 2 houses in Grafton St, Dublin - one of which, No 30, was in possession of the Sticky Back Co, who had paid an annual rent of £300. Irish Times - Monday 28 January 1907 p7. "CAR ACCIDENT IN GRAFTON STREET. In Nisi Prius Court on Saturday, before Mr Justice Gibson, the appeal of the plaintiff in the case of Grossi v Collins was heard. It appeared that in August last the pony and cart of William Collins, of Fishamble street, was in Grafton street. A passing motor car frightened the animal, and sent the cart against Sticky Backs plate glass window, smashing it and doing damage to goods in the shop. Spiriodne Grossi, popularly known as "Stickyback,” the owner, brought action for damages against Mr. Collins before the Recorder, and his Honor gave plaintiff decree for £20 6s. 3d. Against this decree the defendant appealed. After hearing the evidence of Police Constable O’Brien and other witnesses, Mr. Justice Gibson affirmed the Recorder's order, with costs." Possible Identity of practitioner LLOYD, Henry L. possibly took over the business from Spiridione Grossi. H.Lawrence Lloyd. References: Belfast News-Letter - Tuesday 22 November 1910 p5 referred to The Scottish Temperance Life Assurance Co Ltd v Henry L.Lloyd. This was a legal action to recover rent allegedly owed on premises at 36 Grafton Street Dublin, known as Stickybacks, where a photographic business was carried on. Lloyd had a lease on the premises from the Scottish Temperance Life Assurance Co Ltd, but the lease came to an end and the local authority had a magistrate's authority to pull down the premises. The dispute was about the terms on which Lloyd held the premises between the end of the formal lease and the point where the premises were taken down. Wicklow People, Saturday 20 July 1912 p6 carried an advertisement: "Shop hours Act. you would be disappointed on arrival in Dublin to find Mr Sticky Back closed. To prevent this one of his two studios (Nos 30 and 34 Grafton Street) will always be at your command. No 34 closes for half day every Friday, No 34 closes for half day every Saturday." Ebay for sale 25 July 2018. Photo postcard portrait of gent in suit – on reverse H.L.Lloyd (Mr Stickyback) 30 Grafton Street Dublin. Wicklow People Sat 12 July 1913: "Visitors to Dublin. H.Lawrence Lloyd "Mr Stickyback" The Studio, 30 Grafton Street. Everything photographic. Wedding groups a speciality. Send PO 3/- and any old or faded photograph, and one beautifully finished enlargement mounted, measuring 20 inches x 15 inches will be sent post paid in seven days. Groups extra". See below another product by H.L.Lloyd (Mr Stickyback) in the form of a postcard of a "head in the hole" (or Tintamarresque or face in the hole) cartoon of a mounted jockey. On the reverse is "H.L.Lloyd, (Mr Stickyback) 30 Grafton St, Dublin". 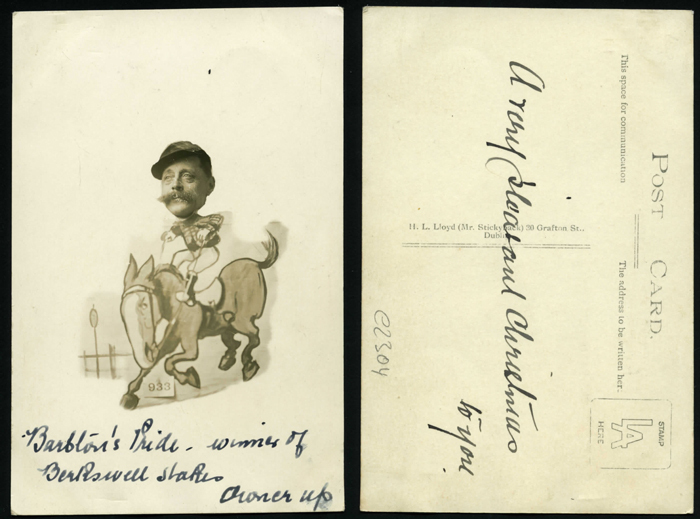 The owner has added his own text "Barbton's Pride, winner of Berkswell Stakes - owner up", and on reverse, "A very pleasant Christmas to you". Note; the in-shot ticket number 933 stuck on the front of the cartoon prop. Unfortunately neither the surname or location have led to identifying the jockey in question. There is a local trade directory entry for H.L.Lloyd, photographer at 202 Sauchiehall Street Glasgow 1910-11 (Glasgows Victorian Photographers www.thelows.madasafish.com/alpha/IJKLs.htm) Also, in 1913, Henry L Lloyd is recorded in the Register of Voters for Glasgow, as a photographer at 77 Renfrew Street, Glasgow, and also at 202 Sauchiehall Street Glasgow, home address shown simply as "Dublin". The Bioscope Thur 29 Jan 1920 p112: John Cotton, Lancs and Yorks Section: " I was very interested to see Mr. Harry L. Lloyd in Manchester the other day, and was given, to understand that he was on a business visit for the purpose of booking films, etc., for his hall at Bethesda, North Wales. I was very much surprised to find our friend in the Trade, but congratulate him on his sound judgment in giving up sticky-backs for the movies. This gentleman was for many years associated with the Stickyback Studio in Grafton Street, Dublin, and was always well disposed towards our business, and being a born showman, I feel sure he will make a success of his hall at Bethesda." According to the Jacollette blog: https://jacolette.wordpress.com/2012/07/12/irish-nurse-world-war-one-era-portrait-by-lloyds-of-grafton-street/: "Directories show that this firm was based at 30 Grafton Street from c.1910 until 1939. It was run firstly by E. Henry Lloyd and then by H. Lawrence Lloyd." On Flickr.com Paul O'Farrell has posted a postcard portrait of a World War 1 British soldier taken by Dublin photographer H.L.Loyd (Mr. Stickyback) 30 Grafton Street. An inscription on the reverse reads "July 19 1917, yours sincerely George A. Foord" www.flickr.com/photos/33577523@N08/15712536040. References: Irish Times - Thursday 18 October 1906 p4. Advertisement for Moy Elta Grand Fete, various attractions listed including: "Sticky Backs and photos by Messrs Finnerty and Co 9 Westmoreland street". References: Dublin Evening Mail - Thursday 22 November 1906 p3. "STICKY-BACK PHOTOGRAPHERS AT WAR Rival Dublin Studios. Remarkable scene in court. A dispute between Dublin sticky-back photographers was investigated at the Southern Police Court, before Mr Swifte, today, when Henry Roe McMahon, Aungier street, was summoned by John Arnall. 11 Camden street, for the alleged unlawful detention of fifty photographs and one dozed mounts. Mr James W.Davis, solicitor, prosecuted and Mr McCune, solicitor, defended. Mr Davis, in opening the case said it was a row between two stickyback photographers. Complainant went into the witness box. He stated that he had been a photographer in Dublin for six or seven years. Mr Mccune. Has the witness been sworn? Witness - I have been sworn, do you want me to swear again? I will if you like. Do you believe that book? asked Mr McCune, dramatically pointing to the testament. Witness (warmly) - how dare you ask that question. My father was a Wesleyan. Mr McCune - Are you in the habit of boasting of being an atheist? Mr Davis here protested. Mr McCune - He does not believe in a supreme being. Mr Davis - you are full of holiness this morning. Mr McCune said he was not in the habit of putting questions without a reason. Witness - I have never in the whole course of my existence appeared on and Atheistic platform. Continuing his evidence witness said he carried on an extensive business. the defendant was once in his employment and had charge of a small studio. Defendant remained with him as an assistant until September of this year. After leaving him the defendant opened a shop of his own in Aungier street. Outside defendant's shop there were three photo frames and witness discovered that these frames contained a number of photographs which had been taken in complainant's studio in Camden street. Defendant, when he was in witnesses employ, insisted on taking a couple of negatives of each photo. at first complainant thought that was due to defendant's want of confidence. the cost of material for sixpenny photos was one penny. The value to the public was sixpence. Mr McClune - Did your business prosper during the last few years since defendant was employed by you? I put him in charge of a shop which brought in an income of £15 per week. Its business went down to £7 a week. Mr Swifte - Did you make any application to Mr McMahon for the property? Yes I made two applications and did my best to get the pictures back. He further stated that all the photos were taken within a period of three months in one particular studio. For the defence it was stated that photos displayed by the defendant were given to him as presents by friends. Defendant went into the box and gave evidence in support of this. he said that he opened a studio about three weeks after he left Mr Arnall. He said he had never taken any of Mr Arnall's property. All the photographs exhibited by him were his own property and those which had been taken at Mr Arnall's were given to him by friends. Several witnesses were called in support of this statement. Ultimately the summons was withdrawn on the defendant undertaking that he would not exhibit in future on his premises photographs taken at Mr Arnall's studio." Thaddeus C. Breen's listing of Photographers and Studios in Dublin on his impressive Irish Archaeology site (http://www.irisharchaeology.info/genealogy/photographers.html) shows H. Roe McMahon at 11 Harcourt Street Dublin, 25 Sackville street upper and 37 Grafton street 1910-1932. 11 Harcourt st., 55 Lr. O'Connell street, 1933 until late 1950s. References: Irish Independent - Wednesday 09 January 1907 p8. "Photography. Stickybacks enlarged; old photographs copied, cabinet size 12s per dozen, half dozen 7s 6d, quarter dozen 5s; own photograph in Xmas postcards 4s 6d per dozen. E.Brook-Smith Photographer 140 Stephen's Green, Dublin"
Address: 33 Upper O’Connell St , Dublin. Possible identity of practitioner: Not currently known, trading as "American Ping Pong Studios"
References: Photo historian Orla Fitzpatrick in her brilliant “Jacolette” blog for Sept 2011 has a post highlighting a postcard portrait of a young lady by the “American Ping Pong Studios” at 33 Upper O’Connell St , Dublin. In the United States “Ping Pong” or “Penny Portraits” were names applied to those studios producing portraits in the format of small, very inexpensive, photos or postcards for the masses. (i.e. similar in many respects to UK Stickybacks) Such studios could be found at US seaside or other holiday resorts. The name “Ping Pong” was derived from the photographer clicking the back of the camera back and forth into predetermined positions to expose a small part of the plate in each shot. Orla’s post also refers to a 1909 US handbook on how to make money through this type of cheap work. Orla’s find is the only example so far discovered of this US name "Ping Pong" appearing in the UK photographic trade, although the word “American” appears in a fair few UK studio names. This https://griffonagedotcom.wordpress.com/2017/12/23/ping-pong-photos-an-introduction/ is a superb article by Patrick Feaster about "Ping Pong Photos" or "Penny Portraits" in the USA. Neither of these US phrases has been found in the British Newspaper Archive. Possible identity of practitioner: Name not currently known, traded as "The Photographers"
References: Irish Independent - Saturday 03 March 1917 p4: " Enlargements, prints, Abnormi 10d, Stickette 1/-, Lemons for any price, Finishing cardboards 7d, Stretchers 10d, Sepias 1/3d, Pastelles 1/6, Oils 4/-; enclose trade card. The Photographers, sticky-back, Yellow type and General Supply Association, 28 Upper Rutland Street." References: Belfast Telegraph - Thursday 20 November 1941 p2. "Death of Irish Showman. Bought an Exhibition. The death has taken place at Bray of Mr John McGurk, who from being a dealer at Smithfield Market, Belfast, came to be a leading figure in the Irish show business. He was a pioneer of the Sticky-back photograph and at one time ran several studios in the City. One of his most spectacular ventures was to but the White City exhibition at Wembley and transfer it to Rossaire." References: Drogheda Independent - Saturday 22 March 1913 p8. Report of a dispute over renting a shop for a photographic studio in Farrell St, Kells. Ellen Sunderland, 19 Goldsmith Street, Dublin. sued John Kiernan, Carlanstown, Kells, for £50 damages, alleging that she had been told that there were no problems with the property she rented, when, in fact, there was an ongoing dispute with the previous tenant who had been evicted and had erected a stall outside the premises. Mr Horace G Cadney, photographer, employed by Mrs Sunderland, gave evidence. References: Tyrone Courier - Thursday 23 August 1906 p2. "Don't Miss Sticky Back, your photo only 6d per dozen. Guaranteed permanent, beautifully finished, taken day or night wet or fine. We are here for a few weeks only. Don't miss this chance. Sticky Back, Market Square, Dungannon." References: Tyrone Courier - Thursday 05 December 1907. "Come and have your photos taken on post cards at Sticky Backs. Nice to send to your friends this Christmas. 6 for 1s. Cheaper and better than Christmas Cards at Sticky Backs, the up-to-date photographers, 48 Scotch Street, Dungannon". Possible identity of practitioner: SUNDERLAND, Ellen, and CADNEY, Horace G.
Possible identity of practitioner: Nemo? For of course you know that “Stickybacks” have just arrived in town. So put on your Sunday clo’es. And if you’ve never had your photo taken yet. Well, I calculate there ain't no need at all for you to fret. Wear your very nicest smile. Put on your highest collar. If you ever suffer from appendicitis or the “jumps,"
If you ever want a splendid cure for the measles or the mumps. Which of course very nice. I'm perfectly aware I haven’t done it very well. But if you do not like this little tale I’ve tried to tell. References: Longford Journal - Saturday 21 January 1905 P1. "Messrs Brennan and Corr Photographers will shortly open a "Sticky Back" establishment in town. this will be a splendid opportunity for persons wishing to have their photographs taken and the prices will be within reach of all as they will be able to do them at the nominal charge of 1s per dozen mounted on very pretty cards. Specimens can be seen at Miss Cowan's Main Street, Longford"
References: Mid-Ulster Mail - Saturday 15 December 1906 p1. "Christmas Presents. By far the most up-to-date and artistic present to send your friends is a nice card including your own photo. Sticky Backs have a large assortment of those beautiful cards designed by the leading artists of the day. Photos included from 1/6d per doz. Sticky Backs Oldtown Street Cookstown also at Lurgan"
Possible identity of practitioner: RITCHIE, W.M. References: Mid-Ulster Mail - Saturday 23 February 1907 p4. "Wanted 1000 young men and their sweethearts to compete for a reward that is offered for anything excelling the quality and finish of Ritchie's Sticky Backs. the talk and admiration of all. W.M.Ritchie, photographer and lanternist, Garden Street, Magherafelt". Possible identity of practitioner: McTEGART, T.
References: Leitrim Advertiser - Thursday 09 February 1905 p2. "Photography. Do you require your photograph taken? If yes do call at McTegart's Glebe Street Mohill. Cabinets or carte de visite sizes. Groups or family residences taken by arrangement. Post cards of local views kept in stock. Also Sticky-Backs. Prices very Moderate. T M'Tegart Photographer, Glebe Street Mohill." References: People's Advocate and Monaghan, Fermanagh, and Tyrone News, Saturday 25 February 1905, p4, also 11 March 1905 p1: "ARRANGEMENTS have now been made to take PHOTOS and STICKYBACKS at very low rates at LENNON WILSON'S, The Square, Monaghan." People's Advocate and Monaghan, Fermanagh, and Tyrone News, Saturday 21 October 1905 p6: large advertisement: "The Monaghan Medical Hall.... AMATEUR PHOTOGRAPHERS SUPPLIED WITH REQUISITES; DARK ROOM ON PREMISES. Photographs AND STICKYBACKS taken at any time between 9 a.m. & 9 p.m. CHARGES MODERATE . . R. A. LENNON WILSON, PHARMACEUTICAL CHEMIST, L.P.SI., THE SQUARE, MONAGHAN." R.A.Lennon Wilson took over the pharmacy at Monaghan in 1898 from Surgeon Rush. (People's Advocate and Monaghan, Fermanagh, and Tyrone News, Saturday16 July 1898 p3). In the 1901 Census he described his occupation as "Pharmaceutical and Photographic Chemist". He started to advertise photographic services, including stickybacks, in the local press from 1905. Possible identity of practitioner: not currently known. Dates operating: References: Drogheda Independent - Saturday 05 October 1912 p1 and Saturday 28 September 1912 p8. "Great success! Great Success! The Talk Of The Town. STICKYBACKS, Watergate Street, Navan. 6 beautiful photos 6d, 3 cabinet photos 1s, 3 full length do. 2s 6d. Football, wedding and other groups. Terms moderate Photos taken day and night. Sent by post to any part of the country. Taken today, ready tomorrow. Open Sundays." References: Wicklow People - Saturday 25 July 1908. "Photos and Sticky-Backs.— Thomas O'Reilly, 21 Mary-street, New Ross, to inform the public and friends that he has ten years’ experience of funeral and carpentry undertaking; that also he has in stock all sizes of oak, elm, and deal coffins, finished in the latest fashion, and on the shortest notice; also tables, dressers, windows, beds, boxes kept in stock or made to order: choice selection of picture postcards and other stationery; also sweets and fancy cakes kept in stock. Prices to defy competition. A trial respectfully solicited. Please note address—T. O'Reilly, 21 Mary-street, New Ross." This advertisement appeared in a number of editions of the Wicklow People and the New Ross Standard. References: Newry Reporter - Tuesday 24 December 1907 p4. "Business house to let, at present in occupation of Sticky Back Company. Apply 23 Hill Street." References:Wicklow People - Friday 16 February 1973 p9: " Well known Rathdrum photographer dies THERE was much regret in Rathdrum when it was learned that well-known and established photographer, Mr.Tommy Plunkett. died in Reading. England. Mr. Plunkett moved to England some months back, but returned to spend last Christmas in Rathdrum. He was buried in Caversham cemetery on Tuesday last. Mr. Plunkett started his career in 1918. when he began showing silent movies in Rathdrum and various other centres around the county. Later he started taking "sticky-back" photographs at various tourist centres, the most notable being The Meeting of the Waters, and Glendalough, where he made himself very well-known. When eventually, he built up his stock of equipment and established his own business in Rathdrum, Mr. Plunkett found himself in great demand to take photographs at many functions, especially weddings. His fine work was in constant demand in many counties. He was held in very high esteem by everyone in Rathdrum. and was treated with the greatest respect. It could be reasonably assumed that Mr. Plunkett's work is evident in virtually every household around the county. Many of his photographs have been published in "The Wicklow People" for the past forty years. He is survived by his wife, Florence; son, daughters, sister, daughter-In-law, sons-in-law, grandchildren, relatives and friends". References: Kerry Evening Post. - Saturday 02 March 1907 p2. "Look Out. Mr Sticky Back is coming and will open at No 12 Dominick Street Tralee. Six artistic little photos for sixpence". References: The Era - Saturday 21 July 1906 p28. "Wanted. Known, Ground to let, suitable for diving pictures, cinematograph, mirrors, Midgets or any other novelty show; also space for stickybacks. Terms either share or rental; if rental, please bring cash with you. Piper, no 2 Position, Strand Road, Tramore, Co Waterford, Ireland." References: Wexford People - Saturday 23 November 1907 p16: " Civil bills. About a gramophone. Mr John A Greene, merchant, Enniscorthy, obtained a decree against Louis Menet, stickyback photographer, for £5.4.3. in respect of goods purchased. This suit was in connection with the purchase of a gramophone, concerning which there was litigation at the petty sessions some months ago. Wexford People - Saturday 02 May 1908 p13. Three young boys aged 10,13 and 14 appeared at the Wicklow Sessions charged with stealing 9s and 6d from the studio of L.Menet of Main street Wicklow. Appearing as a witness was a photographer there, Arthur James. The children had taken the money from a purse in the studio then gone back into the studio to spend the money on Stickyback photographs. It was alleged that their motivation was to follow the craze of having their stickyback photos taken. Report of concert in Glenvar N.S. on Jan 1st. "Mr E. McConnellogue opened the concert with his usual comic rendering "O Mr Sticky Back". BOY BURGLARS' CONFESSION. BELFAST MYSTERY SOLVED. The mystery associated with an extraordinary series of burglaries, which has baffled the police for a month past, was cleared up at the Belfast police-court yesterday, when two boys, Henry Jack, 15, and James Jack, 17, were remanded on no fewer than 46 separate charges. The burglaries were skilful and systematic. At one place one the burglars fell through a skylight, and, from a pool of blood which was found, it was supposed that he was seriously injured, but no suspicious man presented himself for treatment at the hospitals. At the beginning of this week the robbers' hoard was found under a wood pile at the docks, and with it the clue the mystery. Amid the miscellaneous heap of watches, chains, jewelry, purses, knives, footballs, postage stamps and clothing, the police discovered a " sticky-back " photograph of two boys, which put them on the scent. They were arrested on Thursday night, and made a full confession. The elder lad was in a pitiable plight. It was he who had fallen through the skylight, and there was an ugly wound on his head. Not daring to seek medical aid he had bandaged himself, and the wound was in a terrible condition. Ten charges were entered into yesterday, and the prisoners in each case admitted their guilt.